Hennie Comfort is eighty-six and has lived in the mountains of Middle Swan, Colorado, since before it was Colorado. Nit Spindle is just seventeen and newly married. She and her husband have just moved to the high country in search of work. It’s 1936 and the depression has ravaged the country and Nit and her husband have suffered greatly. Hennie notices the young woman loitering near the old sign outside of her house that promises “Prayers For Sale.” Hennie doesn’t sell prayers, never has, but there’s something about the young woman that she’s drawn to. I’ve had this book in print since it was published. I put it on my tbr shelf thinking I’d get to it soon, but like so many of my books, I never started it. Why why why do I wait so long to read/listen to books that I really really want to read? I guess there are so many books out there that I just get sidetracked. A week or so ago I saw the audio of Prayers For Sale was available through Overdrive. Since I’ve recently gotten addicted to audiobooks, I added it to my list and as soon as I finished the book I was listening to, I started it. Let me tell you, I LOVED this book! I loved the story, the characters, and the way it made me feel while listening to it. The story took me on a trip to 1936 Middle Swan, Colorado. Hennie Comfort, who is 86 years young, has lived there since before it was known as Colorado. Hennie is in great shape for her age and can climb those mountains as good if not better than her friend Nit Spindle who is 17. The two women meet when Nit stops by to see Hennie after seeing a “Prayers For Sale” sign outside her house. The two bond over quilting and a tragedy they both had gone through. Nit starts to think of Hennie as a mother figure and Hennie is very fond of Nit. The two enjoy their quilting group, talking about life over cups of coffee, and their walks to town or up the mountains. The book gave me many emotions. It had me happy, sad, and even worried how things would turn out. The characters seemed real as did the situations. I loved the writing and the way the people talked. I loved everything about it. I’m so glad I decided to listen to the audio of this book because not only is the book one of the best books I’ve ever read (and I am not a fan of historical fiction), but also because of the narration. It is narrated by Maggi-Meg Reed. I’ve always been very picky when it comes to narrators, but I loved her voice and she’s now one of my favorite narrators. I’ll definitely be reading more from this author, and from this narrator. The ending surprised me so much. I never in a million years would have thought that it would end that way. I loved this book from the beginning to the end, and will more likely than not listen to it again sometime. I definitely recommend this book! 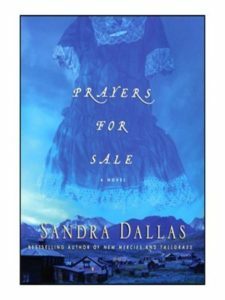 I have read several of Sandra Dallas’ books and liked all of them. This is one I haven’t read. I may possibly own it, but will have to check. Good to know that the audio is well done. I love audiobooks. Of course, I still love books in print as well, but I love the fact that my story can go with me, whatever I’m doing (or mostly). I still love print books too, but like you said, it’s so convenient to be able to listen on your phone, ereader, or iPad. I read the print edition. Aren’t audiobooks the best?! Yes they are Mary! I listened to them sporadically for a few years, but something clicked this year and I can’t get enough audiobooks now. This sounds wonderful, Vicki! I may select this for my next audio book. I hope you do decide to listen to it Susan. I loved it!